This is the plan for the Ultimate BLISS Science - DREAM PARK - Edutainment Complex. 1. the amount of COHERENCE - in your heart - is your heart singing in bliss?.. 4. whether your heart is in phase with the AVERAGE OF THE WHOLE AUDITORIUM! - in other words - HAS GROUP BLISS HAPPENED? by phase lock. HeartBeat 2000, Update:Project Goes GLOBAL! Image - finally - that the Heart EKG waves - were connected to laser display gimbled mirrors. This produces 'LISSAJOUS' standing waves IN LASERLIGHT - showing instantly WHICH HEARTS have musically come into sync..
NOW - IMAGINE WHAT THIS LOOKS LIKE IN LASERLIGHT - in 3D Blissfully OVER THE STAGE...!! 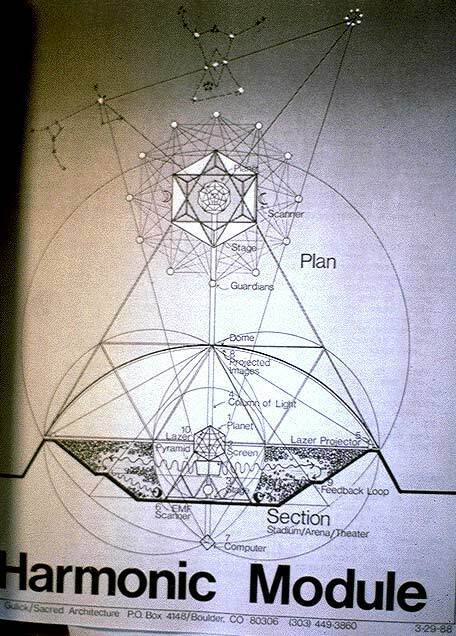 Drawing thanks to Bob Gulick, Sacred Architecure, Telluride, Colorado,USA- HARMONIC MODULE PROJECT TEAM..
1. Bliss - "the best medicine there is", is scientifically measurable and entrainable. Consciousness' very presence and optimal functioning in our body is known as: bliss, and deeply reminds us of what health really is. 2. The Heart Tuner directly measures internal coherence, also called harmonic inclusiveness, which is directly connected to our most contemporary understanding of what Consciousness is, and how it functions inside our physical body. 3. The working principle of the Heart Tuner honours both ancient and contemporary traditions of life, peace and consciousness, but only the Heart Tuner makes it measurable, based upon a sound scientific basis. 4. Compared to the direct measurement of internal coherence, (harmonic analysis) all other methods are either (bio-) mechanic, subjective, indirect, or simply inadequate. The Heart Tuner gives an uncompromising direct biofeedback reward for Bliss Process. 5. The Heart Tuner is successfully adapted for therapeutic use and self-empowering bio-emotional health entrainment. 6. Especially for those not yet accustomed to really "be in their Heart", and come in touch with, and playing with their emotions, and balancing head and heart, the Heart Tuner is like taking an X-ray of your inner-I-feeling, and offers a flawless "lie-detection" for those who tend to cheat their therapist (our their spouses, our themselves..). 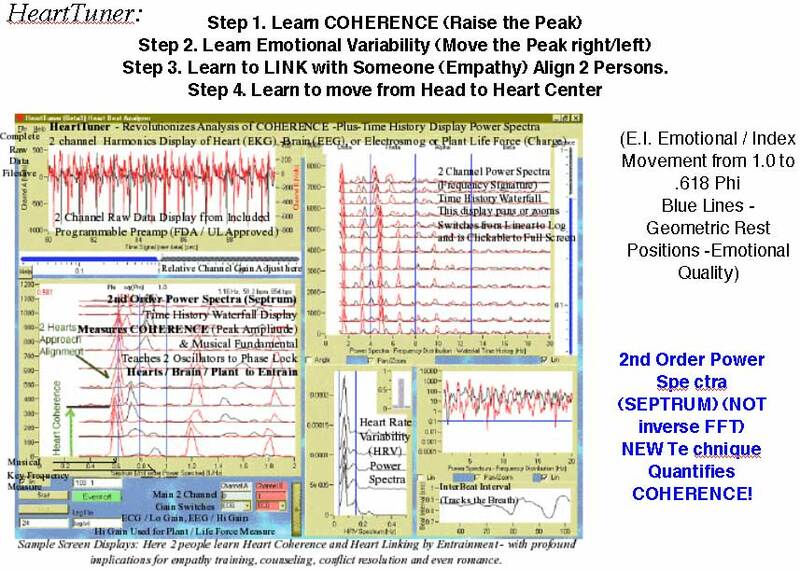 7.. Other therapeutic fields that closely relate to what the Heart Tuner measures are e.g. kinesiology and sacro-craneology. The Heart Tuner proves a valuable guide and indicator to quicken and deepen our insight of how succesfull a treatment is. Software modules are being developed adapted to both the diagnosis and presentation of the measured data as common in different therapeutic fields. 8. Besides, the Heart Tuner screen provides a lot of traditional supportive information like power spectrum, HRV-plot, -spectrum and -histogram, and offers the possibility of history-recording all for the same price, in the same package. 9. The Heart Tuner has two channels and can thus be a great indicator, or "lie-detector" during consensus process between two people, already if they are not yet married. 10. Further options include software for EEG - neuro feedback and groupconsensus and bliss process, the "Hearts Valentine" sound and visual feedback game and experimental life force measurement in nature. 11. Besides for therapeutic use and self-empowerment, The Heart Tuner was often chosen by professionals worldwide as an extremely affordable tool e.g. for dream, pineal, or consciousness research. 12. Working with the Heart Tuner means: working with a deep scientific understanding of the true, inner nature of Bliss, Peace and Health. Hundreds of interest groups around the world have dreamed together for many years of the day when it would be possible to measure and teach with feedback - LINKING HEARTS AROUND THE WORLD. A very spiritually based and planet healing vision of this plan has been called 'The Harmonic Module' (from Planet Heartworks) - . In addition - this capability to link hearts into phase lock and measured coherence TOGETHER, serves many immediate practical and business functions - CORPORATE CONCENSUS PROCESS, CONFLICT RESOLUTION, ( see especially the Science of Peace University group - http://www.goldenmean.info/peaceuniversity ), GROUP MEDITATION, HEALING and PRAYER, etc. 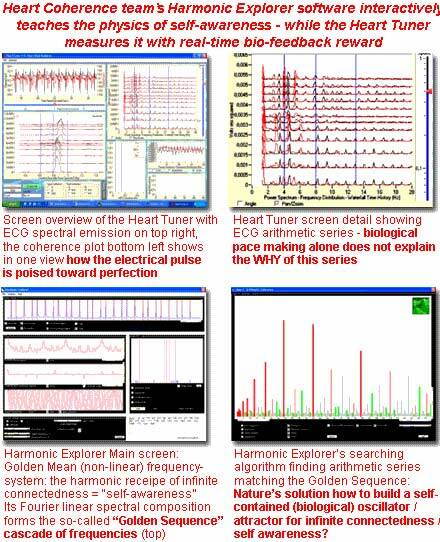 The brand new HARMONIC MODULE software for HeartTuner links 2 to 40 or more hearts (or even brain harmonics) over computer Internet or Intranet connection. (1 HeartTuner and computer required for each 2 people ). The corporate boardroom - AND the warring military may never be the same, now that sincerity to link hearts is measureable and teachable! to be offered to serve as the initiatory visions of a mythic hero in high visibility media like..
major transformative film or stage projects. with these visions is solicited. transformed by the vision of Earth as one body. the Christ Child- was about to be born.. CRYST-all-ize. collective bond to ONE mother.. Earth). wholeness/ONENESS requires intimate knowing of the way of this corridor. The alphabet is originated also by exactly this sequence. of your attention, to touch a larger pattern or body of mind. unpacked from your 3D view of the spinning pulsing eros of the Sun. Next we'll discover that Earth is the weaver of genetic material within this field of form. and the World Grid" by Becker and Hagens). alignment of stars, stop and ratchet the action: an exact trace of DNA magically appears. called "City of Revelation", "New Jerusalem" (cf John Michell "City of Revelation"). Kit") have vortex twister centers: each a torus (donut).... 6 pairs, 6 donuts, 12 faces. Thus all of matter is generated from transformations of ONE flow form. tetrahedron's seven spins, and the torus donut are mutually co-defining. The alphabet is born of the same ONE form. analyzer breaking down the wave components of the letters into their sonic rainbow. sphere, 4 cells.. a tetrahedron, then octahedron, cube, and ultimately dodeca-icosahedra. mean spirals, along the path of growth of the babe. and dis-order, disease, incoherence.. to be self destructive. bubble forms by the pressure geometry of the trails of stars' gravity. Roaring.. burning..
lock", bonding with universe Mater, matter, and mother occurs. the heartbeat is an electrical wave exactly a 7-color torus. (cf: "When Time Breaks Down"
The toroidal layers of the muscles of the heart are 7, from the spin axes of the tetrahedron. intentionally created musically in Manfred Clynes (& Gurdjieff's) work. PLANET GRAVITY/MAGNETIC BUBBLE MEM BRANE. of light, emotions are the template by which consciousness maps her gifts onto biology. of the matter", emotions become standing waves when they are integrated to coherence. Earth's gates, nature has provided whale songs. orgasmic spark gap- galactic synchronization beam (Arguelles) to the galactic Egg. Christos fertilizes across the universe the way of Mat(t)er's uplift to ONEness. the sonics to be actually form-generated through the visuals. HEALING IN CONTEXT, Nesting Memories In-Form-Ation. The Healing Potential of the Harmonic Module. has been a high data leverage healer for centuries, no license required from the A.M.A. the brain and the sonic phase alignment of the glands for optimization of metabolism. system. You steer the long waves, and the short waves will find their nest. group-mind welding experience of ONENESS. sense of the MERKABBAH, in the technology of our MODULE design. upon the outer forms of the meeting space (whether Planetarium, Cathedral, or Stadium). and switched by its moire lit grid position within the planet body. is easy to convey as the 3D image ratchets around the 3D screens. see-hear-feel the seeding Cryst-all role biology is to play in her Galactic dodeca egg context. sonic, emotional, and laser lit, embrace of our much larger body of ONENESS. support for the more ambitious stadium version.